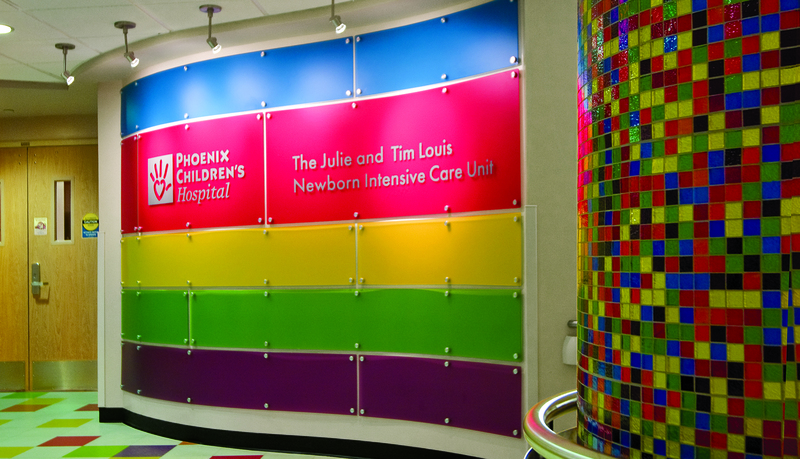 The Newborn Intensive Care Unit (NICU) at Phoenix Children’s Hospital is one of the largest in the U.S. named for Dr. Herbert J. “Tim” Louis and his wife Julie, the NICU unit is an extension of the Good Samaritan Regional Medical Center. The nursery of the NICU expanded to 38,000 square feet – four times its original size – and it include 76 private patient rooms, making it one of the largest and most advanced facilities of its kind. 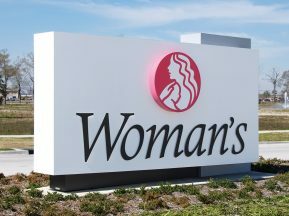 HKS, Inc., the design architect for the NICU expansion, needed a signage partner to fabricate and install a large donor recognition wall that would honor the Unit’s namesakes as well as other key financial contributors. 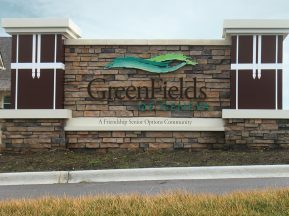 The design intended to provide a warm and energetic “thank you” to the generosity of the donors that made this project possible. ASI was awarded the scope of work to fabricate and install the HKS concept. 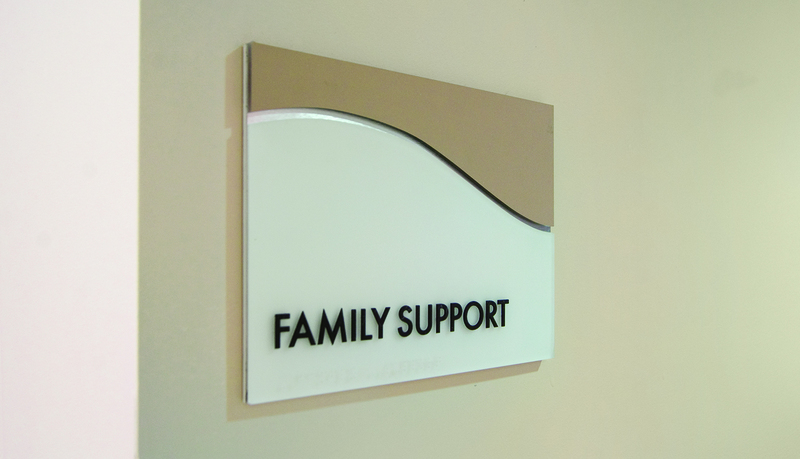 The donor wall’s large component panels, made from 3form’s Varia Ecoresin material, are mounted to the wall with brushed aluminum stand-off fasters. 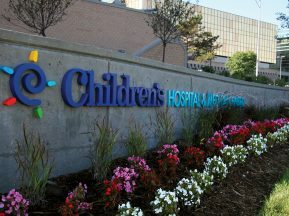 The brightly colored translucent panels are thin enough to allow a smooth and even contour following that of the curved NICU entrance wall. 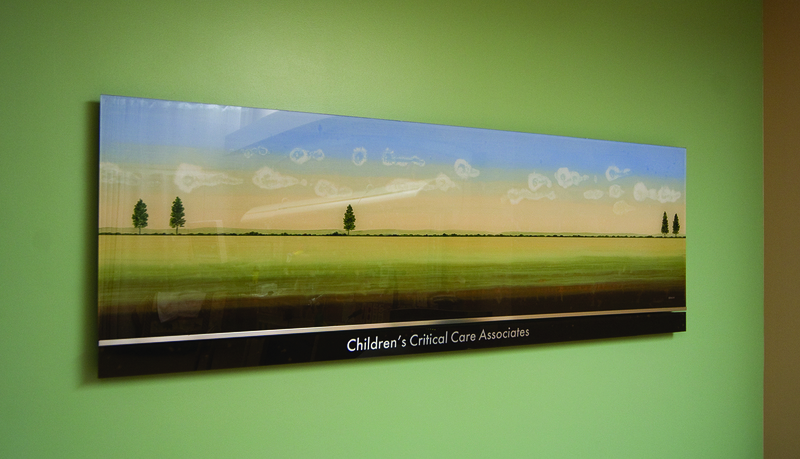 The names and contributions of the NICU donors are silk-screened on the face of the panels. 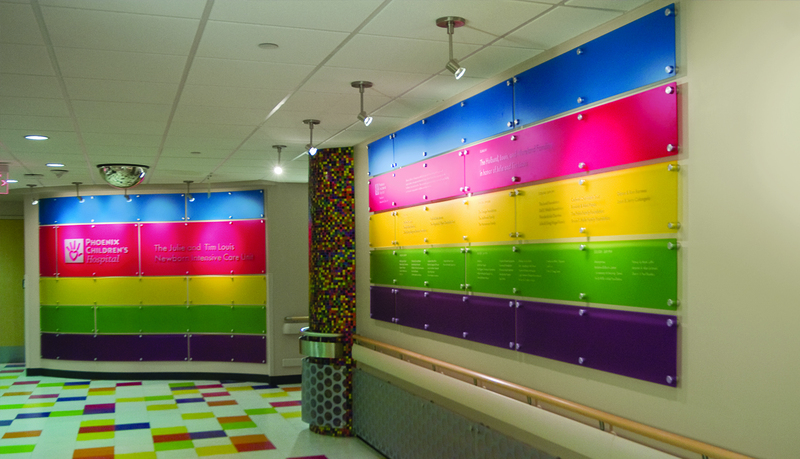 In addition to being an attractive and functional material solution, the Varia material panels also contain 40% recycled material and they complement the Chroma material block murals in the main hallway leading to the entrance of the NICU. 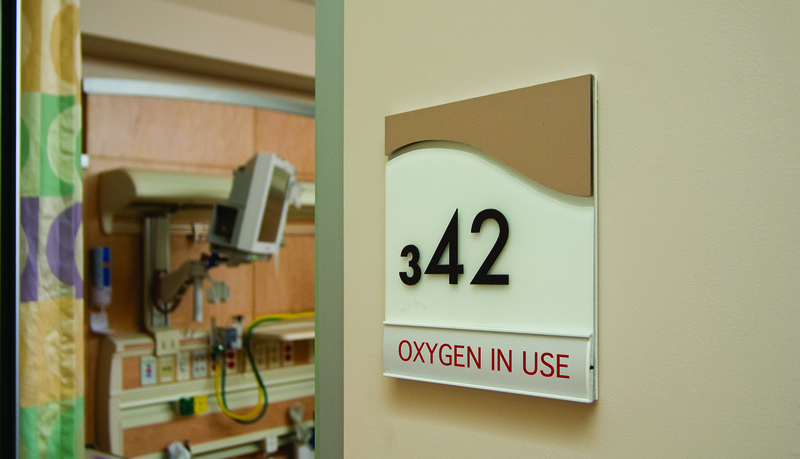 For the nursery rooms inside the NICU, ASI provided custom updatable room ID signs and frosted cut vinyl graphic appliqués for the sliding glass doors. 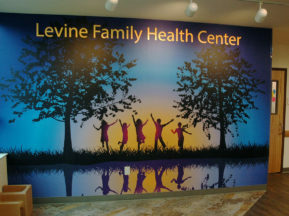 ASI also provided full-color digitally printed graphics for glass sidelights that decorate the individual room entries.